A unique driver focus and a truly revolutionary cab paved the way for the instant success of the Volvo FH when it was first launched in September 1993. It was also the most technically advanced truck of its time and now – a quarter of a century later – it remains an innovative leader, not the least within areas that directly benefits drivers, such as safety and driver care. Add numerous of ground-breaking solutions within environmental care and productivity and it’s clear that the Volvo FH has changed the world of trucking forever – and there is the promise of more to come. Claes Nilsson, President Volvo Trucks, sees the Volvo FH as the backbone of Volvo Trucks when it comes to image as well as creating profitability for the customers and offer a state-of-the-art workplace environment for the drivers. He recalls how the bold introduction in 1993 marked the start of a very successful time for Volvo Trucks. “We were coming towards the end of a recession, but decided to make a big push, and this proved a real success. We launched the FH at the right time and had the most attractive product when the economy and transport market turned upwards again,” says Claes Nilsson. The first version was based on a new chassis with a dynamic design that facilitated flexible solutions for different transport applications. Everything had a clear business focus, including the fuel-saving aerodynamics, ground-breaking driveline and the Volvo Engine Brake. It was however the new cab that really signalled how the Volvo FH was something special. Volvo Trucks decided early on to put the driver at centre stage when over 1,500 drivers took part in extensive clinics. The end-result was a safer and comfortable cab that created a whole new driving, resting and sleeping experience. “Volvo Trucks has always been driving progress, but Introducing the FH was a bigger step than before and one that really shows the drive of our engineers to use new technologies to add value to our customers and their drivers,” says Claes Nilsson. For drivers this dedication meant no less than three cab face-lifts between 1993 and 2008. Then, in 2012, the all-new Volvo FH was launched, where a completely new cab and an integrated climate system I-park Cool created premium comfort. Since then, features like Volvo Dynamic Steering (2013) has led to easier, safer, more stable and precise driving while reducing strain injuries. From day one, the Volvo FH has been a forerunner in safety. Not the least within passive safety, where Volvo Trucks was the first truck brand to offer an airbag (1995) and introduced Front Under-run Protection System (FUPS) in 1996 – ten years before it became a legal requirement. This progress continues to this day and the truck is also equipped with the latest active safety systems. Alongside driver comfort, safety has been the guiding star when designing the cab. During the development, the truck was subjected to thousands of simulated collision tests and around a hundred ‘real’ crash tests. Collision-absorbing beams and doors are made of dual-phase steel and the body panelling is made from the strongest available steel. In short, every detail of the exterior and interior design work together to make the Volvo FH the safest truck to date from Volvo Trucks. The Volvo FH has also taken performance and productivity of heavy-duty trucks to a new level. Among the many innovations, the revolutionary I-Shift automated gearbox (2001) deserves a special mention, since today it has become an industry benchmark as it has evolved to meet different demands and needs ever since. The I-Shift Dual Clutch is especially beneficial for regional and long haul transports on hilly or winding routes. All gear-changes are precisely timed without loss of power or torque, which improves driver comfort and allows higher average speed. For construction and heavy transportation, I-Shift with crawler gears is ideal. It permits the truck to start from a standstill with loads of up to 225 tonnes and drive as slow as 0.8 kms per hour (0.5mph), which make precision manoeuvres in tough terrain easier to perform. I-Shift is a perfect example of an innovation that not only benefits drivers and operators, but also reduces the truck’s footprint. Environmental care is one of Volvo Trucks’ core values, and year by year the Volvo FH has reduced its emissions and fuel consumption. A major leap came in 2017 with the launch of Volvo FH LNG. This gas-powered truck delivers the same performance as other Volvo FH trucks, it can be run on either biogas, which cuts CO2 by up to 100 per cent, or natural gas which reduces CO2 emissions by 20 per cent compared with diesel. This relates to emissions from the vehicle during usage, known as ‘tank-to-wheel’. “We have had a really impressive journey with the FH and there is more thrilling news coming up in the future. Given the new technologies, we are really excited to continue on our successful journey together with our customers and their drivers,” says Claes Nilsson. The Volvo FH is the only model to be named ‘International Truck of the Year’ three times – 1994, 2000 and 2014 – and almost one million units of the model have been sold to date. When it was first launched in 1993, Volvo Trucks announced that ‘the future is here’. 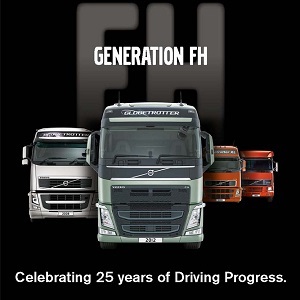 A quarter of a century later the company is adamant that the Volvo FH is still the truck of the future. “There are so many possibilities to create fantastic improvements. We will explore all of them to make sure that the Volvo FH remains the drivers’ first choice and keeps delivering profits for our customers. Without revealing too much, it’s safe to say that the coming years will be even more exciting than the first twenty-five,” Claes Nilsson concludes.